Paul Jones and his dad, Bill, who co-own Mold-A-Rama Inc.
Editor&apos;s Note: This story was first published in 2015. Bill Jones is still a co-owner at Mold-A-Rama Inc, but he’s now retired. Their Mold-A-Rama machines now take credit cards, and the price has gone up from $2 to $3 for a souvenir. How often do you hear a story about a rock star freaking out at a museum? According to Ben Blackwell, head of production at Third Man Records, this was Jack White’s reaction when he purchased a John Deere tractor mold from the Mold-A-Rama machine at Chicago’s Museum of Science and Industry, which they visited together during some downtime on the White Stripes’ 2005 tour. You insert two bucks, and hydraulic arms under a plastic bubble press two halves of a metal mold together. After 60 seconds of histrionic gadgetry, the contraption spits out a polyethylene tchotchke that smells like melted spatula. It’s an old-school 3-D printer, except it’s faster, clunkier and makes only one thing. White and Blackwell liked Mold-A-Rama so much they bought a machine for their record shop in Nashville. I heard that Chicago has the most Mold-A-Rama machines. Is that true? How did we get so lucky? As it turns out, the first part of Julie’s question is easy to answer because nearly every Mold-A-Rama machine in a public space is owned by one of two companies: Unique Souvenirs in Lake Wales, Florida, and Mold-A-Rama Inc., in Brookfield, Illinois. Clearly, Chicago wins, with 27 machines. But it was the second part of Julie’s question that’s intriguing: How did we get so lucky? To answer that, we need to find out how the Mold-A-Rama business in Chicago came to be, and what makes it tick. “Surrounding Lake Michigan is pretty much the heart of Mold-A-Rama,” says Paul Jones, who co-owns Mold-A-Rama Inc. with his father, Bill Jones. The company is based out of a small storefront in west-suburban Brookfield, just five minutes from the zoo, and they maintain most of the Mold-A-Rama machines in the Midwest. Julie’s use of the term “lucky” is apt, since Bill Jones essentially founded the local company on a whim in 1971. He was a Michigan State grad with a high-paying, but dull job in accounting. His secretary was married to the Mold-A-Rama operator who owned all the machines in Chicago. When she revealed that she and her husband wanted to retire, Bill offered to buy their business. The gamble paid off, though, with the business surviving spikes in the price of plastic, sales slumps and the 2008 recession. They’ve also been able to raise prices here and there. The figurines originally cost 25 cents; for the past four years, the price has been two dollars. Paul says it will stay there until the price of oil goes up again. Paul adds that “family” is part of the operation’s longevity. The mold boat is kept afloat by more than family ties, though; it also happens to have a specific business strategy. Mold-A-Rama competes with other souvenirs: flashy toys, plush animals, educational videos, reusable mugs and shot glasses. The secret to Mold-A-Rama is that it avoids zoo and museum gift shops altogether. The company has profit-sharing agreements with its hosts, and the machines are scattered throughout client locations, often offering figurine likenesses very near their real-life counterparts. At the Brookfield Zoo, for example, the gorilla figurine is on sale inside the ape house. Clever parents will avoid taking their children to the gift shop for fear of spending too much, only to succumb to a cute, two-dollar figurine. Another reason why Paul is able to stave off competition is that no new Mold-A-Rama machines have been manufactured since the 1960s. 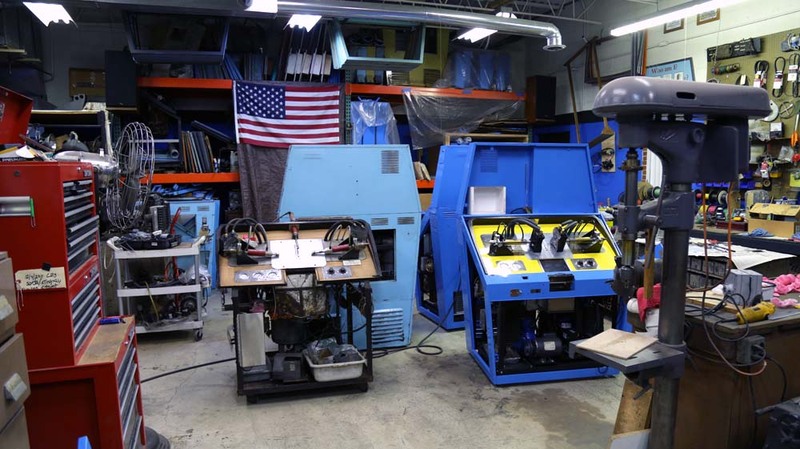 Mold-A-Rama, Inc., and Florida operator Tim Striggow are essentially maintaining the original stocks of machines: cleaning them, making repairs, and adding new parts on occasion. Every Mold-A-Rama machine you can see — in Chicago or Florida or in Jack White’s record store — is at least a half-century old. This is only possible because the machines — manufactured in Chicago, along with pinball machines — were so well-built in the first place. During a recent walk-through of his warehouse, Paul shows off has a dozen machines in various states of repair. He’s nervous about us or anyone else taking photos, though, and maybe he’s right to worry; if someone got the details of how his machines function, he says, they could build their own, and that would blow this whole thing wide open. A Disney “imagineer”, James Asher, actually reverse-engineered his own mold machine, and, while he maintains the project is just a hobby, it’s possible to imagine mouse-shaped clouds on the horizon. What does the future hold for this niche of all niche industries? Costs are low, Paul says, and the strategy is already laid out: keep selling figurines at two dollars a pop. According to him, sales this year are better than ever. He feels the company will keep up the momentum, since people just enjoy seeing something tangible made right before your eyes. We’ve been learning that there are more reasons behind the souvenir’s longevity, though. An active online community shares photos and stories about the figurines, and our own call for Chicagoans’ experiences with Mold-A-Rama show people notice — and even love — the figurines&apos; quirks: the colors, the designs and, of course, the smell. As you can see in the responses, nostalgia’s part of the souvenir’s ongoing success. 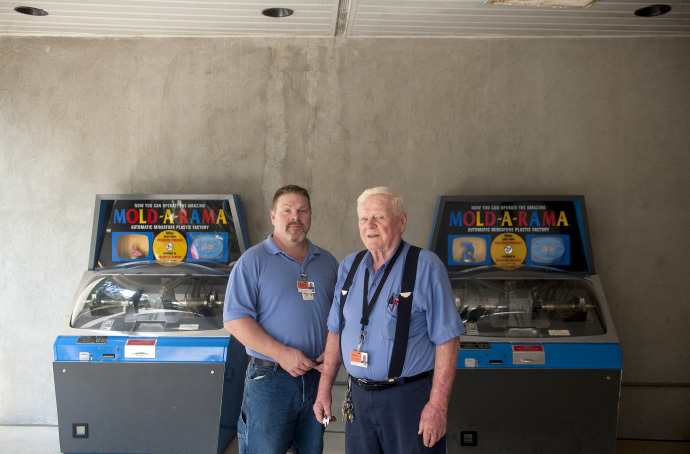 Mold-A-Rama fans are a multigenerational bunch, from grandparents who encountered the machines decades ago to grandkids experiencing it for the first time. Collectors often shell out more than $200 for a rare figurine, and some pay up to $15,000 for their own machine, like Jack White. Fifty years of accumulated memories is part of the Mold-A-Rama legacy and a major reason that Mold-A-Rama’s “luck” is unlikely to run out any time soon. 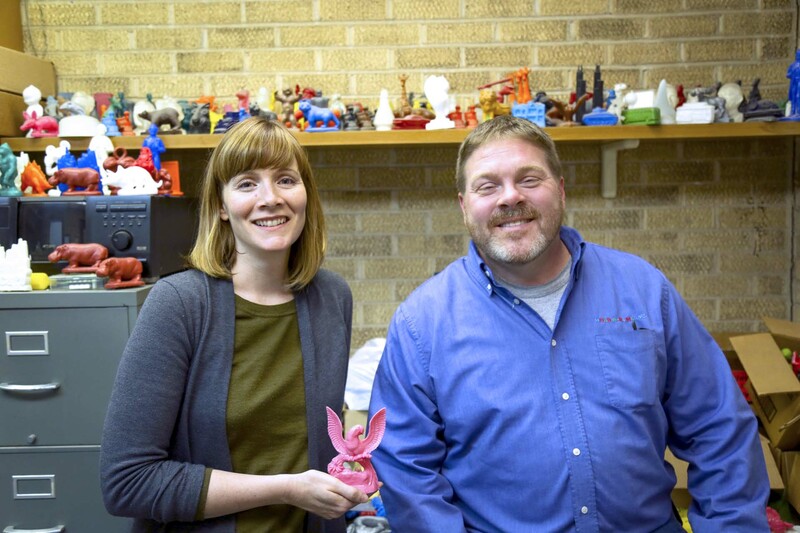 University of Chicago librarian Julie Piacentine grew up in California, but lucky for us, she moved to the Mold-A-Rama heartland as an adult. After telling coworkers that she was heading to the Brookfield headquarters of Mold-A-Rama, Inc., to help report this story, co-workers flew out of their offices with Mold-A-Ramas in hand to share their own stories. “There’s clearly this persistent love for Mold-A-Rama machines,” she says. Julie herself may have missed out on this quirky regional obsession as a kid, but now she says that she finally has that childhood memory she was looking for, albeit in adulthood. Special thanks to coin-op history wizard Dave Slabiak for research help. Correction: An earlier version of this report misspelled the name of a farm implement manufacturer. The correct spelling is John Deere. John Fecile is writer, filmmaker, and current intern at Curious City. Follow him @johnfecile. *Our count of Chicago’s Mold-a-Ramas included machines operated by the Jones family in the city proper and the Brookfield Zoo, as well as privately-owned machines at the Volo Auto Museum and the Chicago toy boutique Rotofugi, which features molds designed by artist Tim Biskup. 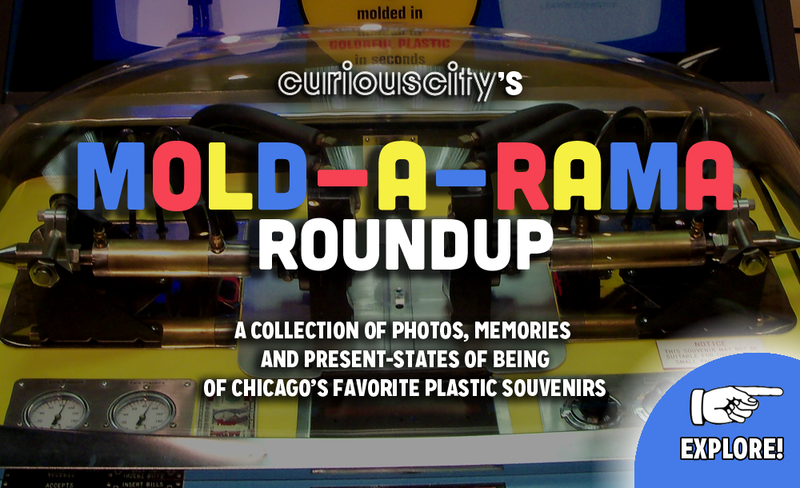 If you know of any other Mold-a-Rama machines in public places that we missed, please notify us by leaving a comment on this page or by emailing curiouscity@wbez.org. What Historical Treasures Are Housed In Chicago Public Libraries? What Happens To The Lincoln Park Zoo Animals In The Winter? What The 'L' Happened To CTA Tokens?